Click here to see Links to Interviews and Articles. Driving home one day from her job as a media specialist at North Surry High School in Mt. Airy, NC, Libby Bagby rescued an injured dog. To her family and friends, this was typical behavior for Libby who already had five other dogs at home. Little did she know how helping this dog was about to change the “plot” of her life. With encouragement from many friends and colleagues and using her 30 years as an educator plus her masters in both teaching and educational media, Libby decided to make it her new mission in life to spread the word about our state’s courageous hunting hound. 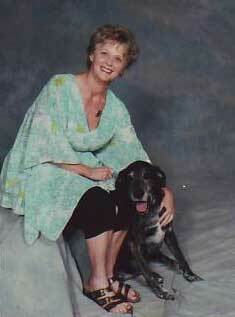 She began by writing a children’s book entitled Lucky’s Plott, A Plott Hound Tale for fourth through sixth graders. It is the heart-warming tale of her Plott Hound’s journey into her life while teaching breed characteristics. But she didn’t stop there! Using her knowledge of curriculum and the educational system combined with years spent researching the breed across the United States, Libby designed a presentation in 2007 to teach other native North Carolinians about this state symbol. Her presentation is entitled "Staying on Track with Lucky's Plott.” In it she explains the history and physical characteristics of the breed, shares information about the Waynesville, NC, family that is credited with originating the Plott Hound, and explains the legislative process involved for an object to become a state symbol. With tons of enthusiasm for her subject and with Lucky by her side, Libby with her collection of primary source pictures, printed materials, and memorabilia collected from the Plott family and Plott fanciers throughout the United States, makes the presentation one “howling” good time! In 2009, Libby completed her second book for students and educators entitled Tracking Plott Hound History, North Carolina's State Dog: A Reader's Companion. Her third book, One Lucky Dog, with coauthor Jan Carmichael, with published in 2013 for kindergartners through third graders. Lucky and Libby traveled North Carolina together for six years visiting 48 counties and teaching over 19,000 about the Plott breed. When Lucky turned 12 years old, he was diagnosed with a condition called megaesophagus. Sadly, he passed away on June 9, 2013. Determined to keep Lucky's legacy alive and to "stay on track" educating people about our state breed, Libby has completed her fourth book entitled K-9 Deputies, A Plott Hound Tale.